Red Sun is a selection from our popular evening sun mixture. It produces an abundance of 3"-4" flowers of only the red shades on strongly branched plants. makes an ideal border suitable for cutting. 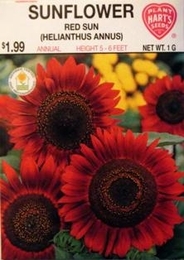 Sunflowers are among the easiest kinds to grow. Sunflowers require plenty of sunshine and water. Keep blossoms picked for best results. Thinning - when plants are 2-3 inches tall thin to 18 inches apart.